With a noticeable decline in imported honey bee and native pollinator populations, there is an interest in gardening to support these insects. While native plants are a better choice for native pollinators, any good source of nectar and pollen will help attract pollinators. 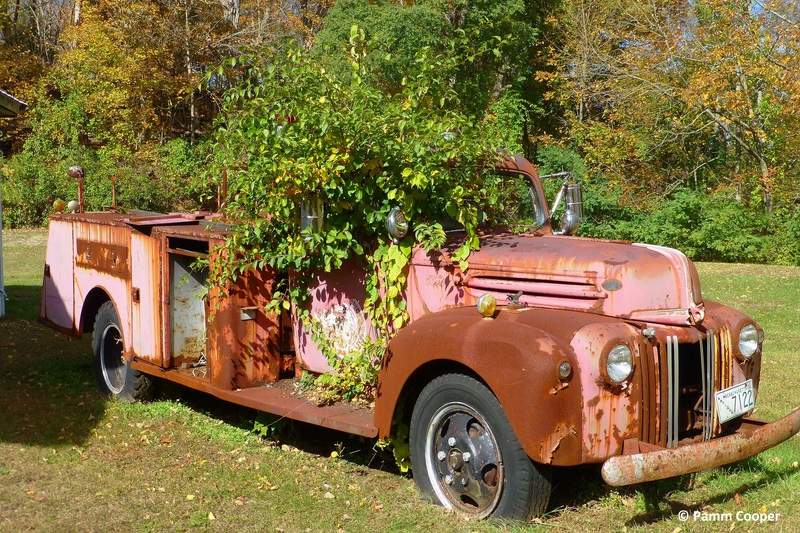 The benefit of using native plants is their durability in the New England landscape. When choosing plants for pollinators, consider the species that are visiting your property already and choose plants for their seasonal or year- long activities. Observe those pollinators that are in your area but maybe not visiting your property, and then choose plants that may attract them during their foraging seasons. There are many species of bumblebees here in Connecticut. Native bumblebees hibernate every year only as queens and every year they must establish a new colony, which will work to support the new queens born that year. Because of the long foraging period of bumblebees- early spring through early fall- provide season –long nectar and pollen sources in the garden or landscape. In the wild, bumblebees visit early blooming maples, dandelions and blueberry. Later on they visit Joe-pye weed, goldenrods, boneset, asters and other late-season native bloomers. They are of a more hardy lot that many other bees, so they are found out and about on chilly, windy days, even during periods of rain. Bumblebees “cheat” when obtaining nectar from some flowers, such as salvia. Short-tongued bees will cut a hole at the base of the flower to obtain nectar on long tubular flowers. Sphinx moths are also native pollinators and are considered the most efficient of moth pollinators. While some fly during the day, many fly at dusk and during the night. These hawkmoths pollinate many plants with their exceptionally long proboscis including catalpa and horse chestnut. If you know these pollinators are in your area, plant corresponding larval host plants for the caterpillars. Honeysuckles (Lonicera) are both a good nectar source for the moth and a host plant for two clearwing moth caterpillars. 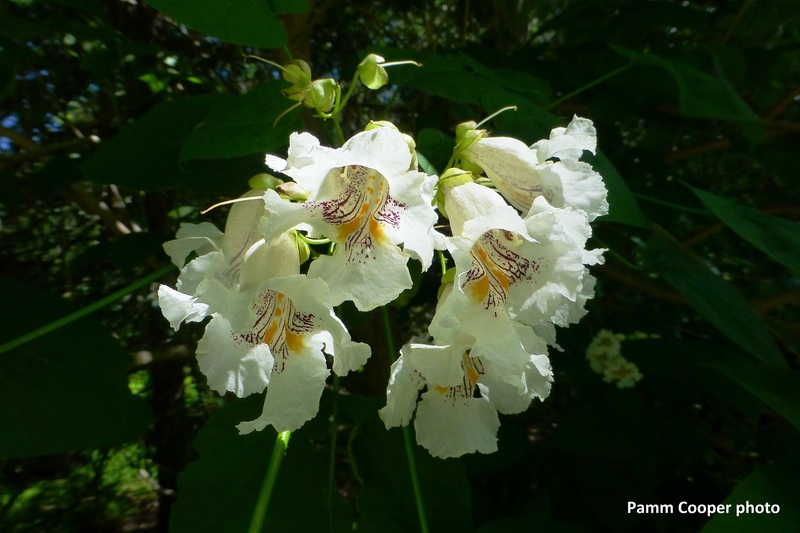 Catalpa flower nectar guides turn from yellow to orange to signify when nectar is the best and steer pollinators to other unpollinated flowers that offer better nectar. Sphinx moths are pollinators of catalpa. There are many beetles as well as flies that pollinate flowers. While beetles may chew on flower parts as well as pollen, they still pollinate many flowers, especially goldenrods, pawpaw and daisies. 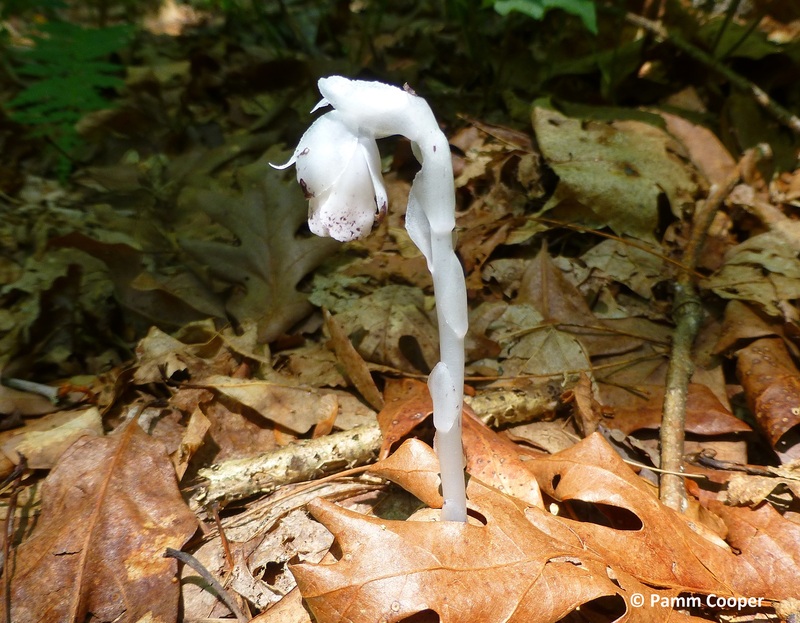 Flies are attracted to flowers that smell like carrion- pawpaw, skunk cabbage and trillium among others. Little flower flies- syrphids- visit many native wildflowers. They are often confused with wasps because of their body shape and coloring. Crabapples are a good source on both nectar and pollen for many pollinators, including beetles, flies and butterflies. Migrating spring butterflies can be found nectaring on crabapple blossoms, and ruby-throated hummingbirds usually arrive in time to nectar on the blossoms. Willows are early spring bloomers that attract a variety of pollinators- flies, beetles, bees and others and are host plants for several butterflies including the Mourning cloak and Viceroy. An excellent draw for pollinators are native cherries- black, pin and choke species. Not only bees are found on the flowers. Butterflies are strongly attracted to native cherry blossoms, and several, such as the Eastern Tiger Swallowtail will Lay eggs on the leaves of smaller cherry trees. Eastern tiger swallowtail caterpillar on black cherry, a plant that also serves as a nectar source for the butterfly in the spring. One of the best plants to attract bees is the Giant Blue Hyssop Agastache foeniculum. This long- season bloomer attracts native and non- native bees and has an attractive aroma as a bonus. Include long-season bloomers like alyssum, coneflowers (Echinacea), Lantana, Cosmos, Heliotrope, Buddleia and clovers. Late summer flowers such as goldenrods, Joe-pye, boneset, Stonecrop sedum, Queen Anne’s lace, Caryopteris, Salvia , and petunias will provide food for migrating butterflies bumblebee queens, and many other insects. Allium flowers are a wonderful attractant for all types of pollinators. And don’t forget milkweeds. Whether native or non-native, a good nectar source will not go unnoticed. Double-flowered varieties are usually bred for the flower at the expense of pollen and nectar, so avoid these plants in a pollinator garden. 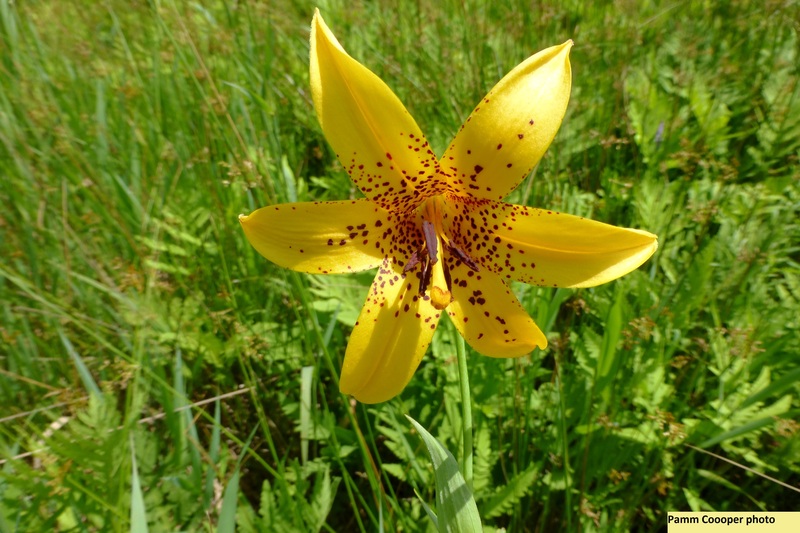 The following link is an excellent source of plants suitable for Connecticut’s native pollinator. Happy gardening! And may pollinators increase in both their populations and their good works in the wild and in the residential landscape. The Spicebush Swallowtail butterfly (Papilio troilus Linnaeus ) is a large, dark swallowtail native to Eastern North America. 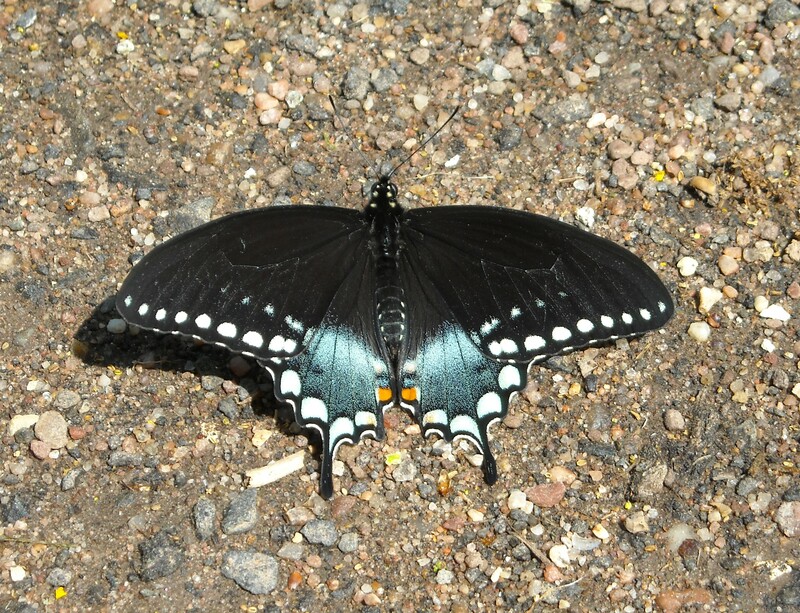 The wings are black with a single line of ivory spots along the outside edge and the “ tails “ along the edge of the hind wings from which the swallowtails get their common name. Females have a blue wash and males a greenish blue wash on the upper side of the hind wings. 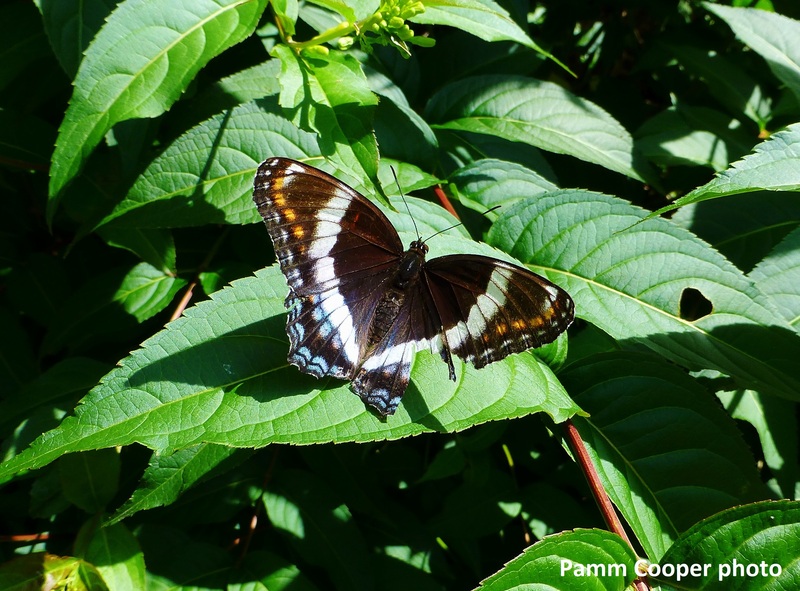 Wingspans range from three to four inches, making swallowtails our largest butterfly. These butterflies are found especially near woodlands, where the males patrol looking for females, but they can turn up in any open areas such as fields or roadsides as they search for nectar sources and larval host plants. Flight in New England is from April- October. Look for them when Japanese honeysuckles begin to bloom in the spring. 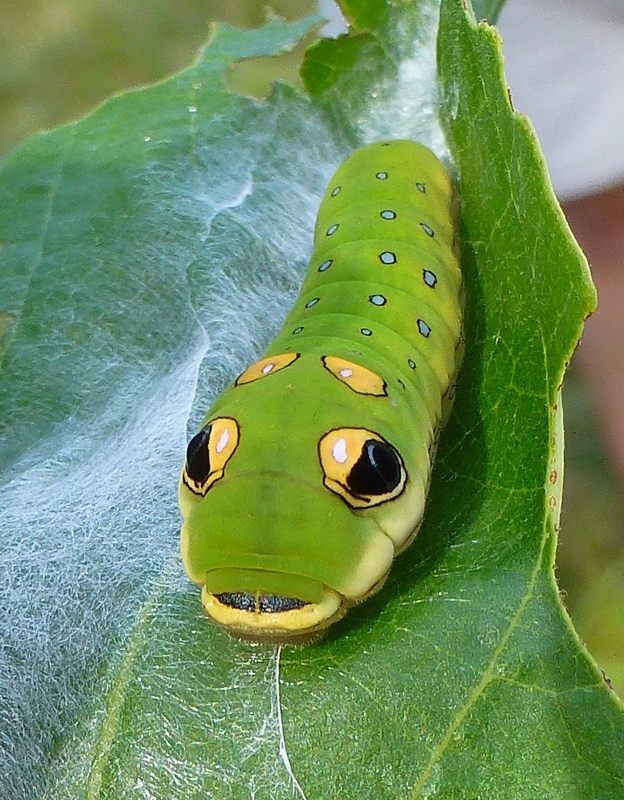 The Spicebush Swallowtail has to be one of the most spectacular caterpillars of any of the North American Lepidoptera. 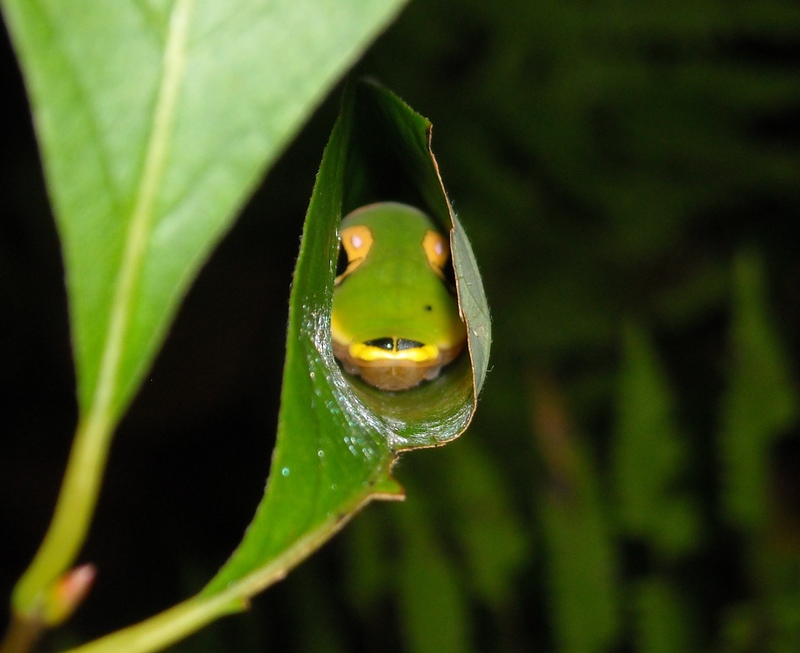 Tucked in a leaf shelter during the day, these caterpillars often go undiscovered unless you know how to find them. First of all, check out the main larval host plants- principally spicebush, sassafras or sweet bay- and then look for leaves that are folded in half length- wise. Gently open the leaf and see if there might be a caterpillar inside. The caterpillar has eye spots on the thorax and usually the head faces the outward tip of the leaf, where it will resemble a little snake. It gets more spectacular in appearance as it progresses through its instars. The eye spots are a good defense against many a bird that would otherwise have them for dinner. 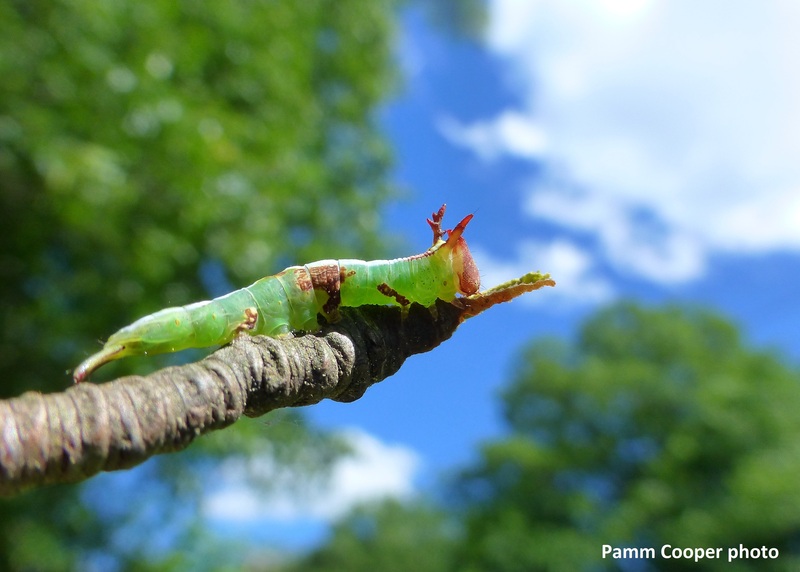 Swallowtail caterpillars also have another defense mechanism- a gland called an osmeterium that can be flashed from the thorax when the caterpillars is alarmed. 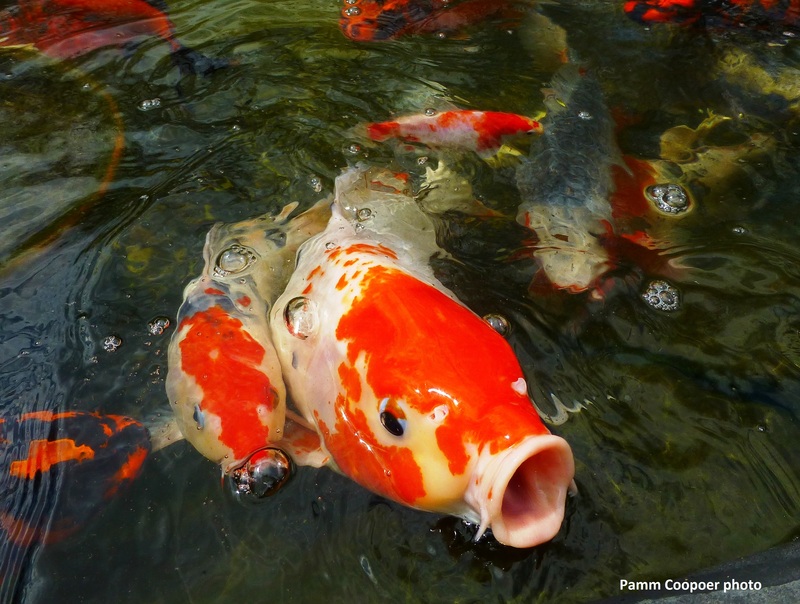 It emits a disagreeable odor that is thought to deter predators. Sometimes just jostling the branch where the leaf shelter is located is enough to cause the caterpillar to use this line of defense. You will be alerted to its presence by the foul aroma, and need only look for the source nearby. When caterpillars are ready to pupate they turn an orange or yellow color t as feeding stops. The host plant may not be the same plant where the caterpillar will pupate, and they will often travel some distance to find a suitable place for pupating. 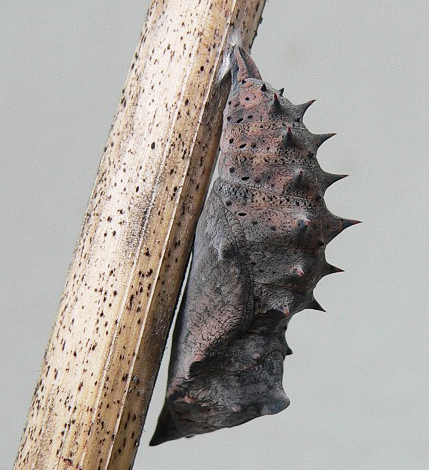 Like all swallowtails, the chrysalis is formed by the caterpillar hanging in a head up position. Feet are tied down with silk and the thorax is hung away from the supporting stalk or branch by means of a silk “girdle “. 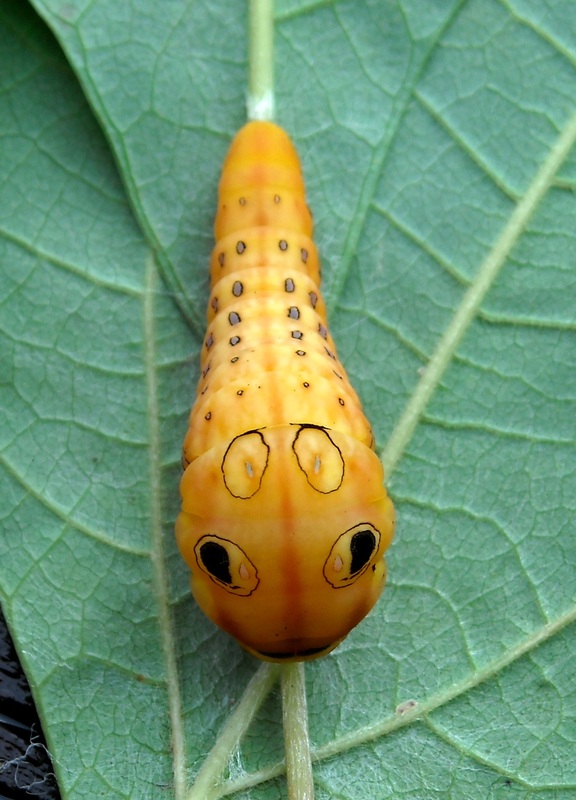 The swallowtail chrysalis will have a set of “ ears “ where the head is, bearing a resemblance to Batman. Chrysalises are green if the butterfly will emerge in the current year, and are brown if they will overwinter until eclosing the next spring. 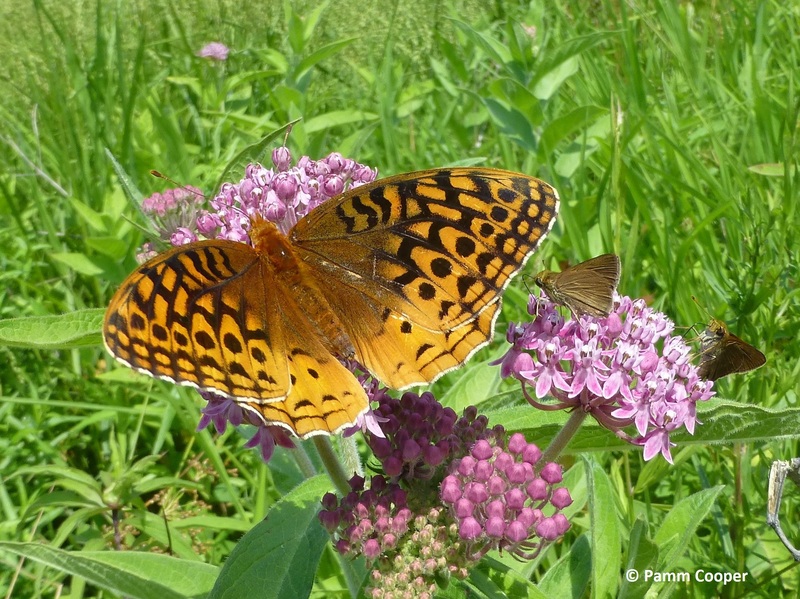 To attract the butterflies to your property, plant good nectar sources that will provide food from spring to fall. Buddleia davidii is a favorite long- season nectar source for many butterflies. Bush honeysuckle, Lantana, goldenrods, Joe- Pye weed, purple coneflower and milkweeds are some plants that are attractive to swallowtail butterflies. In spring, phlox is a good source of nectar, and geraniums, impatiens and marigolds are good annuals to use. The Spicebush Swallowtail is singular in that it is able to enter the flowers of certain lilies like day lilies and Tiger Lilies to obtain nectar that is deep in the flowers. They are able to reach the nectar and then back out again with no harm done. 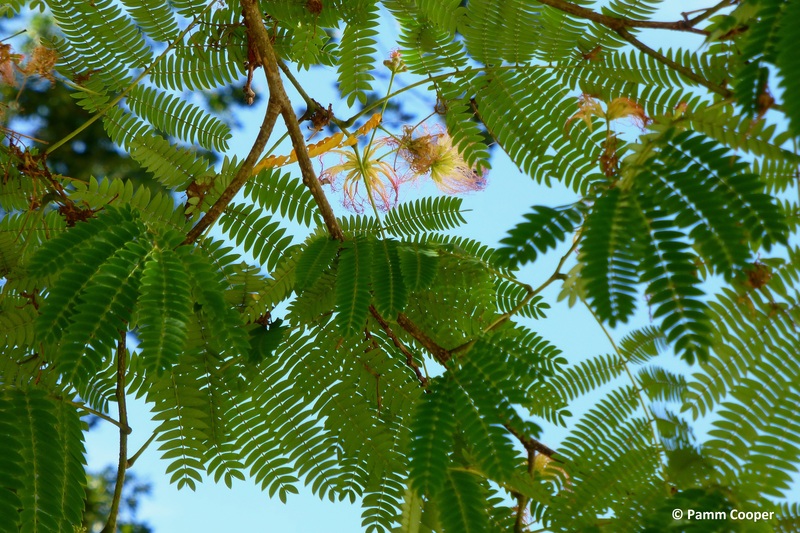 Including larval host plants on your property may encourage females to lay eggs nearby, making it possible to enjoy this creature in all of its life stages. Where are the Monarchs ? Most people who are butterfly aficionados have noticed that the Monarchs are few and far between this year. I have only seen two all year, and I am always out and about on power lines, in meadows, and walking trails where there is plenty of milkweed for the caterpillars to eat and native nectar source plants for the adults. The second monarch butterfly I saw was just this weekend at the Hebron Fair. It was all over the Spotted Joe- Pye weed outside the Better Living building. Hopefully, we will begin to see more as they begin their journey to Mexico where they spend the winter. Any butterflies that emerge in late summer and early fall in the Northeastern United States will migrate to Angangueo, Mexico, where they rest hanging on Oyamel fir trees. 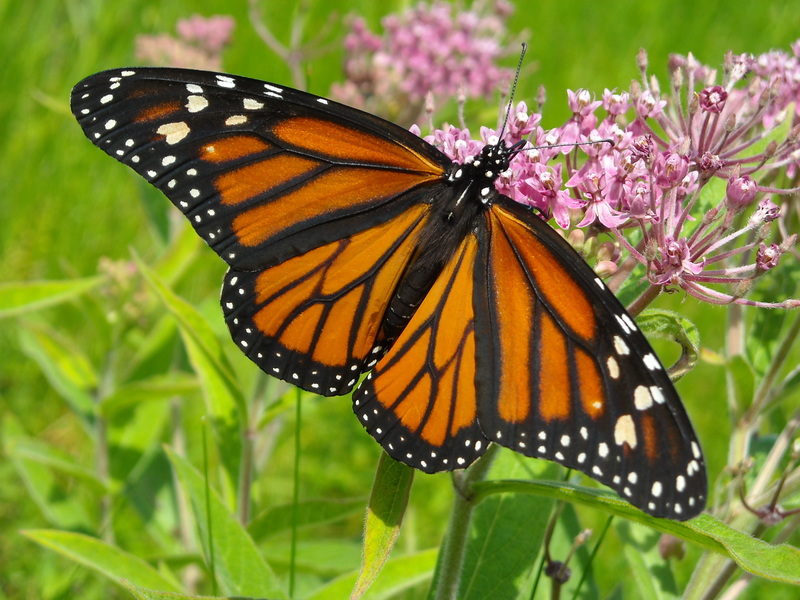 As long as there is not a period of wet followed by a freeze, the monarchs are able to survive even a snowstorm, as long as snow is not prolonged. 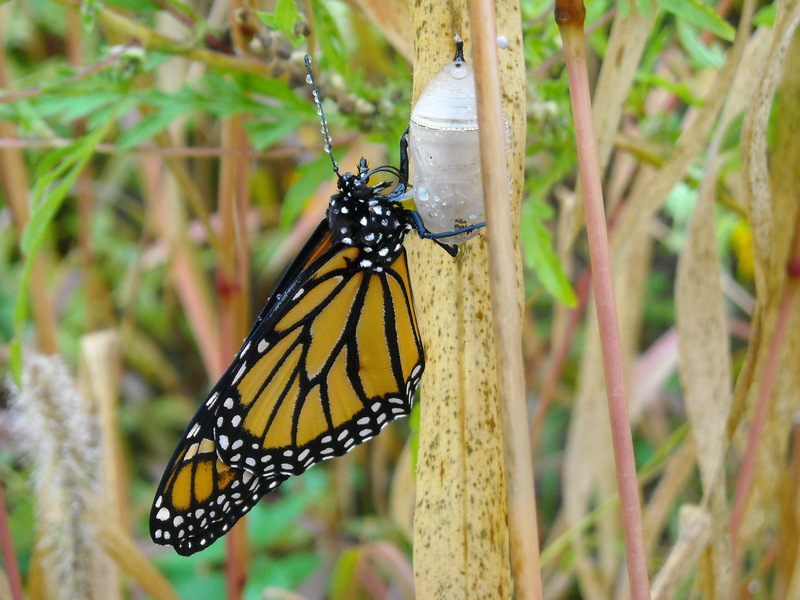 The monarchs that survive the winter will leave their overwintering site and travel back up to the Eastern U.S., laying eggs on milkweed as they go. 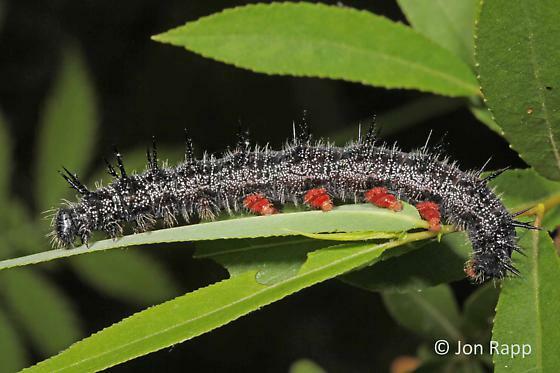 As these early caterpillars hatch and complete their lifecycle, they will also begin travelling north, laying eggs until milkweed sources run out. Monarch butterflies from this second generation are the ones that will migrate to Mexico, having never been there before. When there is a hard winter that is followed by a hard spring/ summer, Monarchs may have a difficult time surviving the journey northward. That is what happened in the winter of 2012- 2013 and the spring and summer this year. The spring was cold and dry in the southern portion of their migration, and flowers for nectar and milkweed for larvae were not as abundant as usual. June here in New England was unseasonably cold and wet and may have slowed monarchs on their way up here. According to “ Monarch Butterfly News ‘, the number of butterflies that migrated to Mexico to overwinter in 2012 was 80% less than normal- 60 million vs. 350 million. 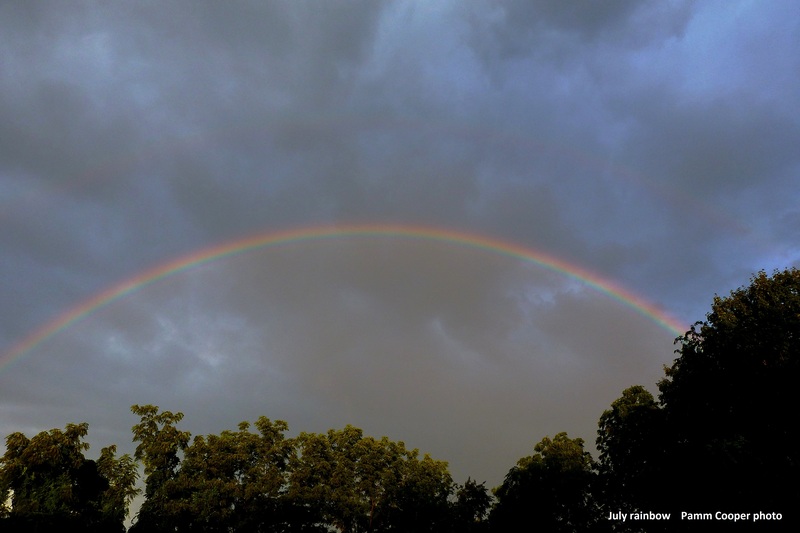 The reason was attributed to low reproduction due to excessive heat and drought during the summer of 2012. So far this year, numbers of both caterpillars and butterflies in New England seem to be very low. It may take a few favorable years to return populations to previous numbers. Some people that have butterfly gardens containing milkweed wonder why they never find a chrysalis on the plant even though there was a caterpillar on it. 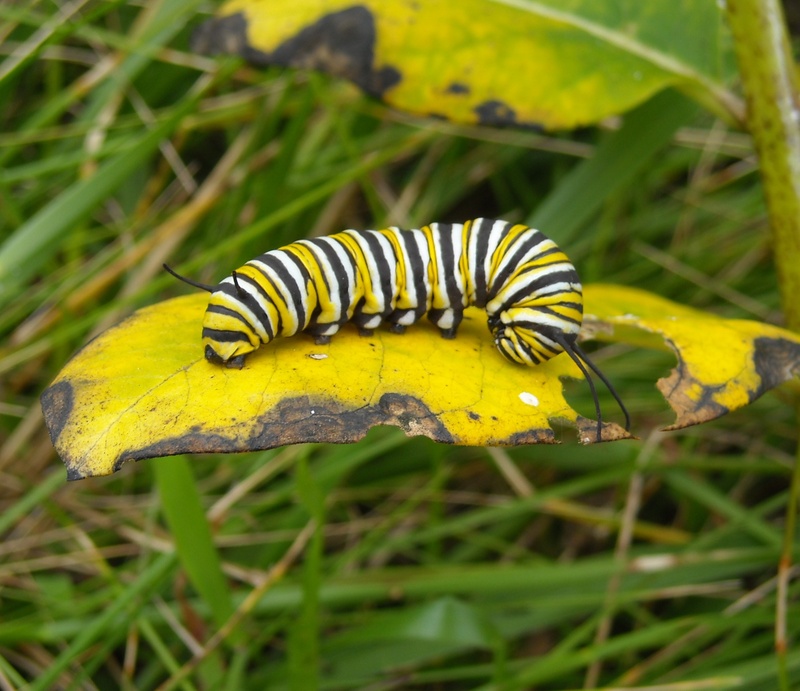 Many caterpillars, including the monarch, leave the host plant and may travel quite a distance before climbing up a plant to pupate. The monarch below I found on a giant foxtail on a rainy September day. 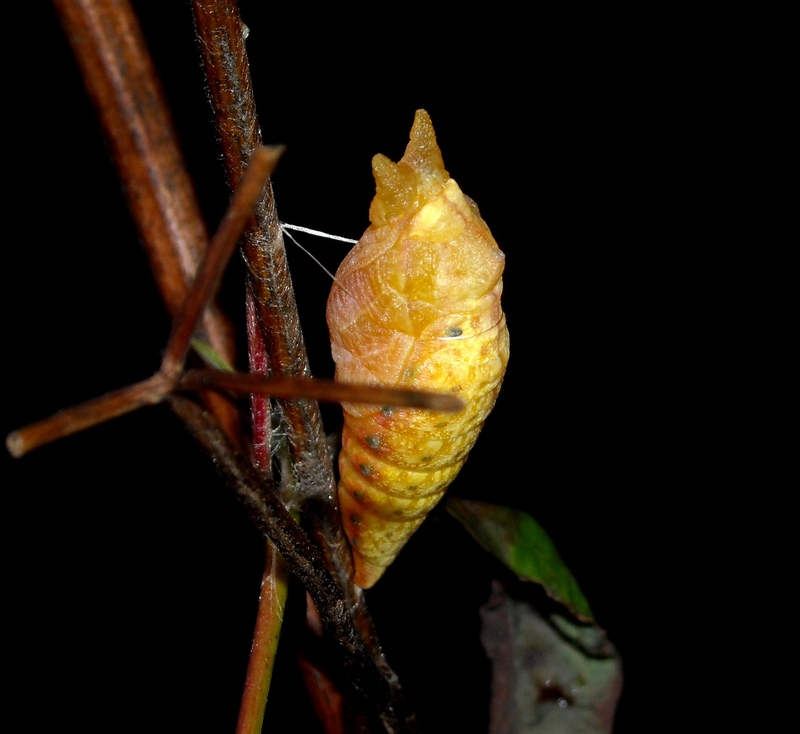 The butterfly is resting right beside the chrysalis shell from which it has just eclosed. This butterfly would have begun its journey to Mexico after muscling up on some nectar. 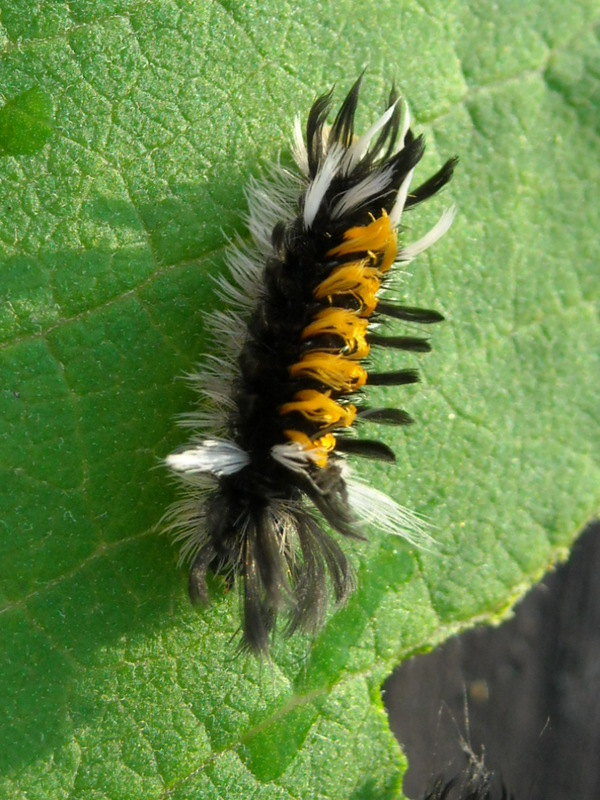 As a final note, sometimes people get worried when they see milkweed tussock moth caterpillars on the same milkweed plant as a monarch caterpillar. They think they will be fighting it out for the same food, when in fact, the tussock prefers the older bottom leaves and the monarch the upper, newer, green leaves. So one minor “ problem “ solved! Above: Milkweed Tussock Moth caterpillar. 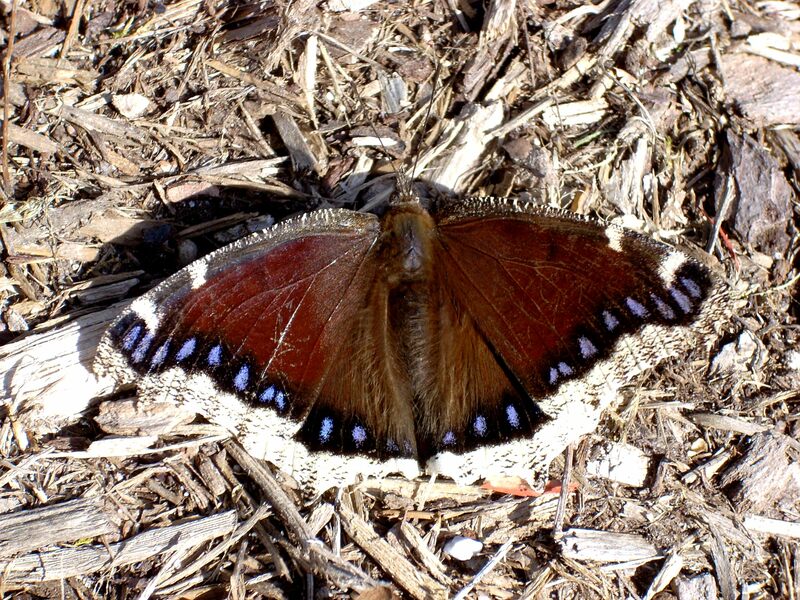 One of the first butterflies seen in early spring in Connecticut is the Mourning Cloak butterfly. Nymphalis antiopa ( Linnaeus ) is one of the our most widespread butterfly species and is also one of the longest living as an adult. Any seen flying about in early spring spent the winter in a sheltered spot. On warm winter days with no snow cover I have seen one or two flying about in sunny, open woods. This is a fairly large butterfly with a wingspan between 2 ½- 4 inches. The upper wings are a deep chocolate brown with a wide creamy yellow border along the outside margin. Just outside this border are a row of iridescent blue/ purple spots. The color of these spots can vary as the sun strikes them at different angles. Males are very territorial, and they defend their area by chasing away, or at least attempting to do so, every perceived threat to it. I have actually had one land on my head, unaware of the fact until I heard a whirring sound and felt something lightly fluttering on my head. It was the male Mourning Cloak I had just seen flying up from the hiking trail just in front of me. It had doubled back and “ jumped” me from behind. It was actually pretty funny, especially since I could see the shadow of it drumming on my head. In such cases, it is often best to move on to another area for the sake of the butterfly. The female lays her eggs in a cluster or ring on a twig or leaf. I have found newly hatched caterpillars in a large group still near the egg ring on a willow twig. 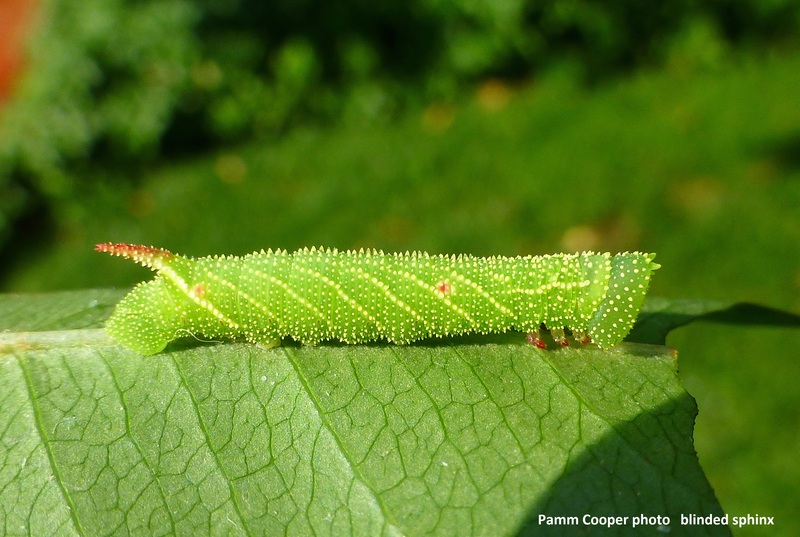 Some of the larval host plants are native willows, Cottonwood, Hackberry, American Elm, poplar, and Gray birch. If you see a Mourning cloak landing on any of these host plants, check and see if perhaps it is a female looking for the correct plant on which to lay her eggs. The caterpillars are fairly easy to spot as they feed in groups, making a web as they go. Their bodies are black with tiny white spots, and they have diamond shaped red spots along their back. Their prologs are a matching red color, and they also have black spikes, which are harmless but fearsome- looking. Mourning cloaks are found most often along woodland edges and watercourses, but I have found them on power lines also, especially where there are wetland areas with native willows. 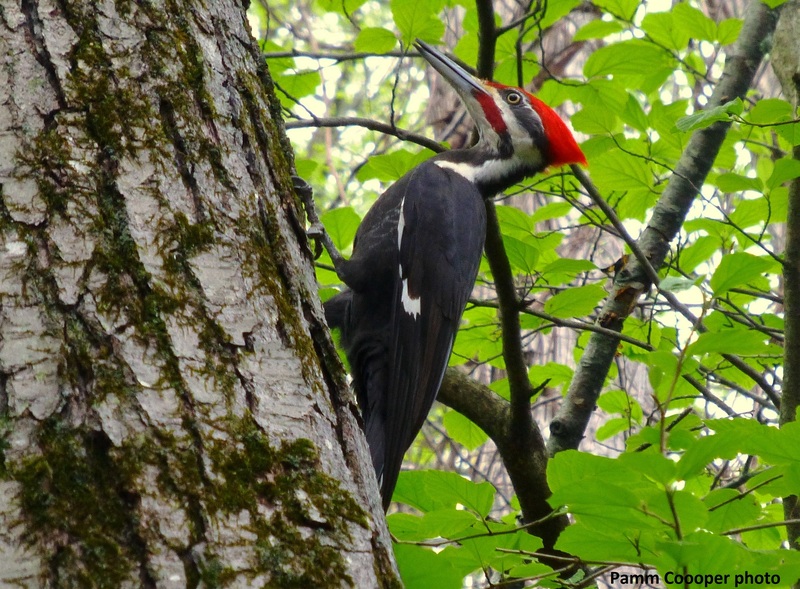 If you are hiking along a woodland trail, you may see take off just in front of you. If so, watch where it goes. It will often be a male who was perched or patrolling his territory, and many times it will return almost exactly to the same area. Even it seems to be flying quite a distance away, even deep into the woods, wait where you are, and you may be rewarded with a close- up view if you stand still, as it usually will return to its resting spot. You can have a little fun with this butterfly. I have held out my hand and had one actually land on it, checking me out to see if I was a threat. They may even try to obtain salts from your skin, as will other butterflies such as the Red Admiral. Mourning Cloaks are attracted to sap flows, such as on cracks found on tree trunks, and also dung or rotting fruit. If there is a sap flow, they land above it and will walk down to it and then feed head downward. They will also obtain nectar from red maple and milkweed, but it is uncommon to see them doing so. 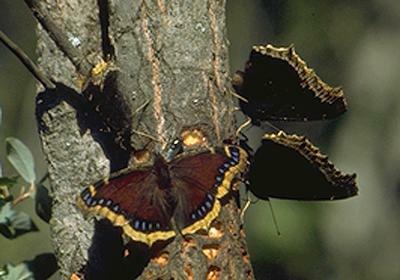 fcps.edu photo of Mourning Cloaks feeding on sap flows from yellow-bellied sapsucker damage. One final word on this butterfly: they often make a loud click before flying away from a spot where they have been resting. The reason for this is unknown but remarkable..